I hear a lot of folks using the terms content marketing and SEO interchangeably. The truth is, though, that even though the two go hand-in-hand, there is a difference. As I covered in last week’s post, SEO is search engine optimization. It’s putting together all the elements that the search engines look for in order to rank in the organic listings in the search engine results. Content marketing is all of the online pieces you use to market your business or yourself – blog posts, ebooks, whitepapers, videos, social media bios and posts, infographics, etc. So what’s the difference? Content marketing is a part of SEO. A good content marketing strategy is going to accelerate your SEO results. 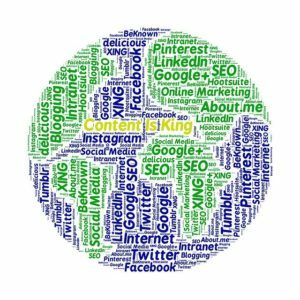 Content marketing is making sure that all of those pieces of content and copy contain the keywords you want to be found for. SEO focuses more on the nuts and bolts of title tags, alt data, meta descriptions, link building, and such, but also depends heavily on all those pieces of content working simultaneously in your favor. Of course, all results depend on when and if the search engine spyders index your SEO efforts and your content marketing pieces. But the more pieces you have in play, the more opportunities there are for the search engines to see you. If you feel your site needs some SEO work or you’re ready to set a content marketing strategy, give me a shout! Let’s talk about all of the elements you need and that SBN Marketing provides, the costs, and how we can make it all work for you!